Reconstruction by Thwaites and Reed Ltd. Detail of the calendar of movable feasts (dismantled). Giovanni de Dondi (1318-1389), a scientific polymath of the Middle Ages, designed and constructed this remarkable and complex clock in Mantua, Italy, between 1348 and 1364. Although the original clock was lost during the sacking of Mantua in 1630, de Dondi left detailed plans which have survived, enabling this reconstruction. 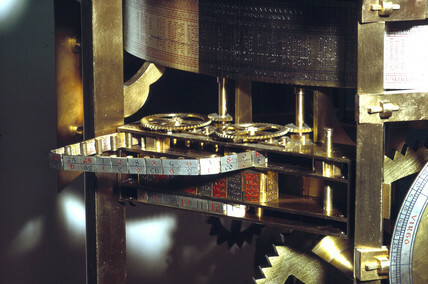 Besides the usual mean time, de Dondi's clock was the first to show sidereal, or star, time and the motions of the sun, moon and the five then known planets (Venus, Mars, Saturn, Mercury and Jupiter), according to a Ptolemaic conception of the solar system (with the earth at the centre and the sun and planets rotating around it).